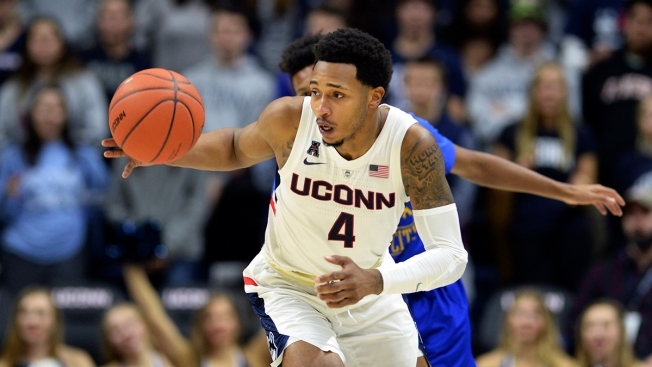 Connecticut's Jalen Adams (4) drives to the hoop after a steal against UMKC in the second half of an NCAA college basketball game, Sunday, Nov. 11, 2018, in Storrs, Connecticut. "Whatever the team needs," said Smith, who has been on a minutes restriction after suffering a quad injury over the summer. "I think I just have fun playing basketball and with guys that are as talented as the guys I play with, and just getting people involved is fun for me." "I thought we showed a lot more of the killer relentlessness for longer stretches when we had a chance to extend the lead," UConn coach Dan Hurley said. "You have to give a lot of credit to UConn," UMKC head coach Kareem Richardson said. "First and foremost they defend their tails off and make everything physical and make everything tough." "I think Tarin is one of our very best players," Hurley said. "I recruited him at Rhode Island and he went to Nebraska on me. I guess that's why I'm not going to start him ... maybe I hold grudges."